That rather annoys me. People are so willing to praise Anna when she is dead, yet they were so deaf to her doom-laden warnings when she was alive. When I discussed Russia with her, we always came to the same conclusion: the outside world just wasn’t interested in bad news about Putin and his thuggish, kleptocratic sidekicks, because it would be bad for business. What annoys me even more though is the ‘hurrah chorus’. The pack of sleazeballs, useful idiots and nutters who insist that everything in Russia is not just profitable but lovely too are now claiming that Anna’s murder was just one of those things. After all, don’t journalists get killed in other countries? Nobody’s perfect. Why pick on Russia? Take, for example, a slick Russia-related email service called Quick Takes. I strongly recommend it for anyone interested in Russia and the neighbourhood, although I disagree with every word in it. Its publisher, Mike Averko, describes himself as a “New-York based independent foreign policy analyst”. “There has been a rush to judgment by many in a manner reflective of an ongoing hypocritically applied set of standards. “In addition to the slain Denver area talk radio host Alan Berg (killed by a right-wing extremist), there’ve been the experiences of Victor Riesel and Yuri Brohkin. Riesel was a not so smooth investigative reporter, who was blinded after writing a series of critical articles about organized crime. Brohkin was a Soviet Jewish émigré journalist who was found murdered. A police investigation ruled Brohkin’s death to be possibly linked with his ties to the so-called Russian mafia. To someone who doesn’t know America, that might sound like a reasonable bit of context. Victor Riesel was indeed blinded, probably in retaliation for his trenchant journalism. What Averko doesn’t mention was that this happened in 1956. Yuri Brokhin, a colourful Russian émigré, was murdered, perhaps because of his writing. But it was in 1982. Alan Berg was a provocative talkshow host murdered by neo-Nazis – in 1984. None of them remotely matches Anna in importance or stature. This oddly forgetful approach to important facts may undermine in some eyes Averko’s argument about “censorship” in “Anglo-American mass media”. Citing “Politkovskaya’s flaws as a journalist”, right now sounds a bit tasteless to me. True, she wasn’t perfect. She never claimed to be. I hope it is not really necessary to point out that over-detailed writing and overly sweeping generalisations are flimsy grounds for a death sentence. It may have been the clouded skies of Russia’s miserably bribed and bullied media that made Anna seem such a bright star. But whose fault is that? Were I Russian, I would be mourning one of my country’s greatest modern martyrs, not spitting on her grave. 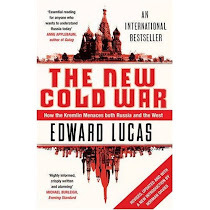 # Edward Lucas is central and eastern Europe correspondent of The Economist. The article accuses Politiskaya, in so many words, of "lies and gross distortions" because, according to Pankratov, the content of a story she wrote in Newsweek differed from an account in, of all things, Izvestia (for which Pankratov provided no citation). Pankratov has a degree in "Physical Oceanography" and writes "explicit" eroticism. That's the sum total of his qualifications to opine about Chechnya. He cited NO published report accusing Politskaya of even inaccuracy much less dishonesty. So how about we start with David Johnson? How did he dare to publish something like this? The item now appears on the JRL website but Anna's piece in Newsweek isn't there for contrast; she's not even allowed to defend herself. People who care about Anna should write David and demand an explanation. If they were willing to say stuff like this about her when she was alive, one can't dare to imagine what they'll try now that she's not. You've given just a taste of what we can expect, it's an issue that requires constant attention. To la Russofobe: you seem to have trouble typing Russian surnames, try cut and paste next time-- it will bring more gravitas to your informed opinions. Just curious: Do you think your message is one likely to cause me to respect and hence heed your advice, in other words a good example for me to follow? Or were you drunk when you wrote it? Let me suggest that you read Mark Twain and try to open your mind a bit to the way other people think, rather than trying to impose your own strictures upon them. It might help you to deal with other cultures better, and avoid giving the impression that you a Russophile autocrat. Twain wrote: "It's a man with very little imagination who can only spell word one way." It's a bizarre notion to Russians, to be sure, which is they destroy Huckleberry Finn by translating it without Twain's grammar errors. What's more, I love my spelling errors. Because they create the opportunity for someone to be unable to deal with any substantive point I make and therefore to attempt to attack me for spelling. I like this much better than getting a compliment from an admirer. When I don't misspell, the alternative is pathetic personal abuse that betrays the true character of the speaker, which is almost as good. But you wouldn't know anything about any of that, would you? Next time, ask a question before you open your mouth and stick your foot in. Isn't it a bit late to hold yourself up as a model of civility, Edward? In your article you label your opponents "sleazeballs, useful idiots and nutters." Surely you could have made room for the possibility of a fourth category, namely that some people simply don't see the world in stark black and white. I do not agree with you on many of your views on Russia. I find them extreme in the extreme. At the same time, I don't consider myself a "In his worldview, they are either "sleazeballs, useful idiots and nutters" and if you think that I should be tagged with one of these labels then you are just a stop away from the notorious "Kim" (who may be actually a man, as you can see elsewhere on the Internet). to edward lucas: do not bother with civility-- people choosing la russophobe as a pen-name do not possess any by default. to la russophobe: do not bother to answer your grunts are not interesting. Anders, I don't dispute that there are sincerely-held different views on Russia. Not all of them are from mad, bad or sad people. But I think to be truly enthusiastic in a Panglossian way about Putin is does fall into those categories. I'm really attacking the "Hurrah Chorus" of people who have a direct personal financial interest in Russia, and use their seemingly respectable western positions as lawyers, bankers etc to claim that everything is OK or better than OK, when they know in their hearts that it is not. Yes, that clears it up. They would be the sleazeballs, right? You should try to make that clear in your articles, too. But for every banker or others with direct financial interest, you can find two (to not put too high a number on it) who do not get paid. Russian government officials behind the murder. show the same respect for Politkovskaya as well. people in a manner that hinders Russia's development. separated through a fine line drawn on water). revanchist Russia bullying small, defenseless others. which has been translated into several languages. the Introduction as well as pages 281 and 282). church services (pages 279 and 280). Politkovskaya attacks Putin for being a "racist"
thinking than Russia's Putin (page 279). about these matters during Putin's presidency. drunks at Hakaniemi Market Square. frozen to a floor in Irkutsk, Siberia (page 194). was so old he could obviously not be all right". brave of her to have said as much. has frequently discussed in an openly candid way. incomprehensible logic for a sound person to comment on. democracy. They were chosen through "democratic"
disgust with Putin is uncritically accepted as the gospel. "gave five percent of its profits to charity". Report: Suuri Maa Pitka Kvartaali, Big Country Long Quartile, 2005). activity would be lost if this point was made. desired by Politkovskaya, Tuomioja and Hautala? In Finland, this advocacy would be considered treason. self-defense. This is Putin's Russia, and mine. viewpoint of philosophy and judicial philosophy. He is also the author of several books on the Russian tax and labor law. If you find my grunts uninteresting, why do you comment on them? Do you mean to imply that you feel you've said something interesting in this forum? If so, pray tell what it was. I think I missed it. I call myself La Russophobe so a hypocrite like you will judge me based on my name while demanding that I not judge Russians. But if you'd read my blog before you judged me you'd know that. Delicious. You're a truly world class hypocrite, just the type who has brought Russia to her knees. Do you attack me personally because you can't find any factual error to attack? If so, thanks for the compliment! And, just curious, do you think that your discussion in this forum is a model of proper civility for others to follow? ANDERS: As I understand it, you feel that your "Finnish lawyer" (who cites virtually no source material) is more reliable than the world's leading media, right? Just curious: Do you also believe that the world was populated by little green men on a spaceship from another dimension and that L. Ron Hubbard is their prophet?